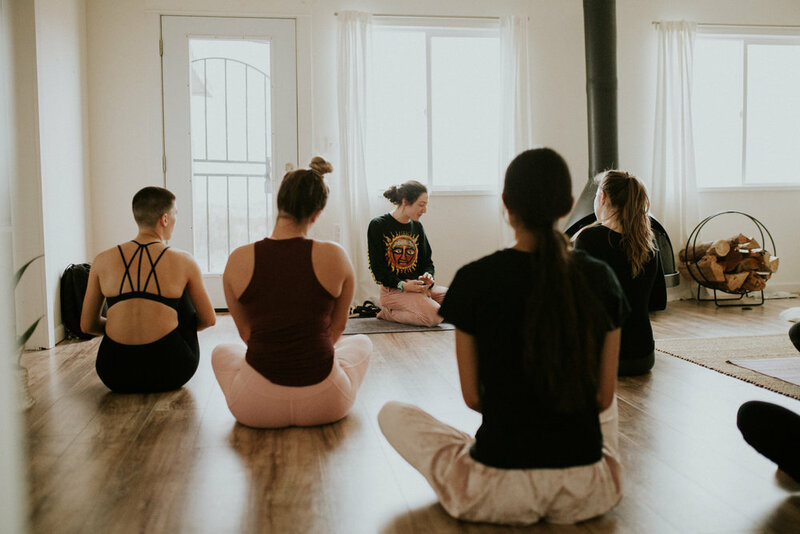 Last weekend an incredible TGS girl gang Unplugged from all social media, and did some serious relaxing, recharging, and goal setting with us while we were in Joshua Tree! Continue reading to go behind the scenes of our little retreat! First, Saturday morning we had an amazing morning Yoga session with our badass Yoga Teacher & TGS gal, Ashley Green! The perfect way to start the weekend. Afterwards we all gathered around to take the Creatives 101 course taught by our CEO Alex Morehouse (which you can purchase & digitally download here), where we all learned some incredible tips and tricks to use in our everyday lives and careers! Some of us were eager to use the insight and sat down to re-vamp our websites and use the time with Alex to really ask the important questions! To really complete this relaxing and refreshing day, after dinner we kicked it off with a Modular Sound Bath conducted by Brandy & Christian. Using Quartz Crystal singing bowls and ‘modular synthesis’ we were guided into a relaxed, receptive, and meditative state. After the sound bath we all talked about our separate experiences and how different but how incredible it was for each and every one of us! Seriously there isn’t enough to be said for how cool this experience was- we highly suggest it! It was such a kickass day and we all went to bed completely refreshed and inspired to tackle our week ahead! Sunday was a slower day as some of us took our last morning of the weekend as an opportunity to catch up on much needed rest, and others woke up to watch our last sunrise in Joshua Tree. We all said a painful goodbye to our relaxing little oasis, and headed to town to grab some coffee and pizza before driving to Joshua Tree National Park to do some clean-up! We learned upon arrival that the park was in fact, contrary to popular belief, in pristine condition with rangers & crews monitoring and wandering the park! Which was such a relief, even though we all arrived there with trash bags and gloves in hand! Ha! But after realizing there was nothing we needed to help with as it seemed they had it under control, we went our separate ways and said our bittersweet goodbyes. The truly incredible thing about all of our Unplugged trips is that there is always a different group of various creatives, a different group dynamic, different vibes, but no matter what- we always end the weekend feeling like a little family, and little more inspired than we were before the weekend started. It was such an amazing Unplugged and we cannot wait for our next one! Get ready & stay tuned, because our 2019 Unplugged trips are about to be next level! This weekend we stepped it up a notch - of course we were social media free in a gorgeous Airbnb in Joshua Tree, but this time we had our girl Ashley lead us in a morning yoga flow, followed by the Creatives 101 course, portfolio building, help with website design, shooting around the beautiful desert and home, and we ended our Saturday night with a surreal sound healing experience hosted by Modular Sound Bath. THANKS FOR READING! STAYED TUNED FOR OUR NEXT ONE!